It’s hard to blame these A.V. Club commenters. These are the agonized cries of a rabid, starving, pained cult following that has suffered through a frustrating season of TV. Most modern, adult-oriented programming either adheres to a strict weekly schedule or drops all at once on a streaming platform; Steven Universe has done neither of these things. In the past year, there has been just one six-week stretch of regularly scheduled new episodes, spanning last September and October. The other 20 episodes of the show’s second season have dropped in now-infamous StevenBombs—heavily marketed, themed scheduling blocks in which Cartoon Network airs one new episode each day for a week. Steven Universe’s four season-two StevenBombs aired in March, June, and July of 2015, and this past January. Hiatuses have permeated the space between each, leaving the plot to lurch forward like the world’s vainest, most self-aware toad. To make matters worse, the fan base knows that season three’s production is complete, and that Cartoon Network is holding back a slew of completed episodes (spoilers have leaked). Is there a method to this madness? Absolutely. When you look at both the history of animated television scheduling and the statistics Steven Universe has generated over the past year, the StevenBomb-hiatus cycle begins to look like a brilliant response to the rise of binge-watching, allowing the show to dominate not only TV, but also the online arena. Let’s examine some reasons why frustration with Steven Universe’s schedule is misguided. Cartoon Network has a lengthy history of irregular scheduling. To get a feel for how Cartoon Network has treated its original series, we can go back to what many consider to be the channel’s classic lineup: the Cartoon Cartoons of the late ’90s and early ’00s, which included such icons as Dexter’s Laboratory, The Powerpuff Girls (the original, not the middling reboot), Courage The Cowardly Dog, Johnny Bravo, and Ed, Edd N Eddy. Overall, these shows tended to run on regular, weekly schedules in their first few seasons before descending into chaos as they aged. Take Dexter’s Laboratory, for example. When it premiered in 1996, its first season ran in two neat blocks: six episodes from April to June, and seven from November into the new year, with three segments per episode. With the exception of a break for the holidays, its second season aired weekly from July 1997 to May 1998—regularity Steven fans can only dream about. But its third season, which picked up in 2001 with a new creative director after Genndy Tartakovsky departed to focus on Samurai Jack, got off to an incredibly jumpy start. It took several months for Dexter’s to find a rhythm; eventually, it settled into a few choppy blocks, each no more than five or six weeks, punctuated by randomly timed new episodes, a schedule that would continue until the show expired at the end of 2003. It wasn’t alone in this regard. The Powerpuff Girls’ second and third seasons, arguably the peak of the show’s popularity, featured new episodes in consecutive weeks exactly twice, from September 8 to September 22, 2000. Same deal for Ed, Edd N Eddy after its first season (its fourth season, which consisted of just 26 episodes in 13 two-at-a-time bunches, contained a nine-month hiatus). And while Courage The Cowardly Dog adopted a fairly strict weekly schedule in its third and fourth seasons, the show ceased production after that. In many ways, the irregular scheduling of the Cartoon Cartoons made sense, setting the stage for how things have been ever since. Compared to live action shows, cartoons (excepting South Park) require much longer production timelines—even with today’s advanced technology, animation still has to be done frame by frame in painstaking, expensive fashion. That’s a major reason why Cartoon Network has never run more than 10 original shows at a time, and why episodes of these shows beyond the first couple of seasons air with increasing irregularity: once the run of initially ordered episodes is spent, it can take longer than a year to prep additional seasons. For example, Rick And Morty’s third season, green-lit last July by Adult Swim, likely won’t air until the end of this year; meanwhile, TBS renewed American Dad for seasons 12 and 13 last fall, likely to expedite production on season 13. Due to animated programs’ idiosyncratic life cycles and its exclusive reliance on them, Cartoon Network has always been fueled by reruns: initially of syndicated Hanna-Barbera, Warner Bros., and MGM cartoons, then of the channel’s own original programming once enough existed. There’s never been enough fresh material—not enough shows, not enough episodes—to provide for brand-new content every week, or even a different schedule every night. And compressing its prized original series’ new episodes into a shorter temporal life span would merely reduce the amount of time those series could be rerun, since the network’s reruns now typically consist of currently active series and not everything can be Adventure Time or Ed, Edd N Eddy (which aired for a surprising 10 years). By creating hefty amounts of space between new episodes, Cartoon Network artificially extends its shows’ lives while giving the animators more time to create new material. And the network’s main audience of elementary-school-aged viewers aren’t the ones tearing up online forums as they wait for new episodes of shows. Extra space between runs of episodes, though, doesn’t necessitate any particular scheduling strategy for each individual run. Astute fans of Steven Universe might point out that StevenBombs are vastly different from the loosely spaced schedules of the Cartoon Cartoons, creating much larger gaps between new episodes that frustrate existing fans and might make it difficult for new fans to stick with the show. But Steven isn’t alone in this regard. Cartoon Network is increasing more programming bombs overall. In fact, 2015 was the year that the bomb became a regular feature of Cartoon Network’s original series. Starting with the first StevenBomb in March of last year, every currently running show on the network has featured at least three weeklong bombs, with the exception of The Amazing World Of Gumball, which has had two. Adventure Time and Steven Universe, probably the twin standard bearers of Cartoon Network at this point, have each featured four such runs, including the November miniseries “Stakes”; that month, Regular Show, another network show that’s reached icon status, got its first TV movie, which is essentially a bomb condensed into a single day. And The Powerpuff Girls rebooted with two straight weeks of daily new episodes, coinciding with an aggressive marketing pitch that included a website where fans could “Powerpuff themselves.” Over the past year, August 2015 and February 2016 were the only months not to feature a bomb of one show or another. The overall effect was positive for Cartoon Network. According to the 2015 year-end Nielsen ratings, the network gained 15 percent more viewers in the 18-49 demographic—the largest relative growth by any of the top 25 basic cable networks, including channel-sharing buddy Adult Swim, and one of only five exhibitions of growth at all—and topped the 6-11 demographic (still its target group) to boot. In an era when television viewership as a whole is flagging badly compared to online streaming, the fact that adults are increasingly sitting down to watch Cartoon Network is nothing short of remarkable. The precise cause of this growth isn’t easy to determine, as we don’t have access to all of Cartoon Network’s numbers (the network didn’t reply to requests for comment for this piece). But with a look at daily ratings, a few contributing factors can be teased out. One was the July premiere of We Bare Bears, a six-episode bomb that averaged about 2 million viewers per episode. Another was Teen Titans Go!, a series that isn’t a Cartoon Network original (it’s DC/Warner Bros.) that regularly drew more than 2 million viewers over the course of last summer. And “Stakes” and the two summer StevenBombs finished with similar stats, each averaging more than 1.8 million viewers per episode. Steven Universe has played an important part in Cartoon Network’s success, and given the obvious ratings boost of the StevenBombs relative to the other episodes of the series—the second and third were the most-viewed episodes of season two outside of the Uncle Grandpa crossover “Say Uncle,” which had the luxury of activating two fan bases—the strategy drew a lot of attention to the show. To really get a grasp of just how crucial the StevenBombs were and are to Cartoon Network, however, we need to turn to another source: Google Trends, a handy way to approximate the interest a show generates on the internet (effectively, how many people are looking to either stream it or discuss it). This chart shows the American search traffic Google has received for Steven Universe since its inception in November 2013, measured relative to its peak (Trends won’t allow you to see absolute numbers). The first significant incline, in March 2015, coincides with the first StevenBomb. Each spike after that falls on another StevenBomb. The slight hump in September-October 2015 represents the six-week period during which Steven aired weekly, and it’s only about half the height of the peak reached during StevenBomb 3. Given that drop-off during the post-Bomb-era hiatuses hasn’t approached pre-bomb nadirs, it seems like Cartoon Network has judged that the triumphant apices are worth the gaps between them. Google Trends is an inexact way of measuring actual viewership—all the traffic could, in theory, be caused by a very small, hyperactive cadre of superfans—but the fact remains that season one of Steven Universe had a number of episodes crack two million television viewers, something that never happened in season two. To witness the show’s internet dominance arise in spite of leveled-off or declining TV viewership is a testament to the fan engagement the series has built, and that engagement correlates pretty much exactly with the StevenBombs. 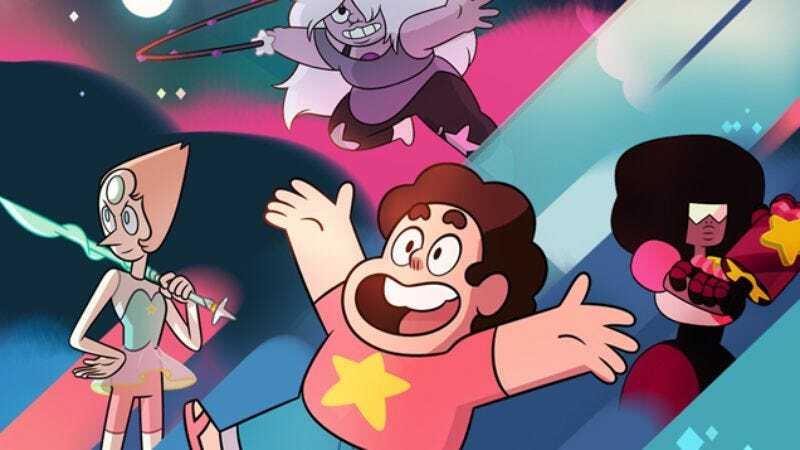 Now, let’s look at Steven Universe in comparison to Cartoon Network’s other top shows. The red line is We Bare Bears; yellow is Regular Show; purple is Teen Titans Go! ; and green is Adventure Time. If you’re looking for definitive proof that Steven Universe is now Cartoon Network’s flagship series, this is the closest you’ll get. To be fair, when you look at the worldwide numbers over this period, Adventure Time rises significantly in 2014, and The Amazing World Of Gumball, which has British roots, becomes far more important. But neither touches Steven in 2015—not during the weekly period, not even during the hiatuses, but especially not during the StevenBombs. So the StevenBombs are working. Why? Steven has yet to hit the peak of interest that Korra generated at the end of its first season (likely because it’s not able to draw on a preexisting fan base the way Korra did with Avatar); meanwhile, around the time of its series finale this past February, Gravity Falls reached all-time highs. The lesson here, though, is that more serialized shows, while they might not generate quite the rerun potential of episodic programs (you can’t just sit down and satisfactorily watch a season finale like Steven’s “Jailbreak” cold), create massive swells of online interest. This proves crucial to a network’s vitality in an increasingly internet-based television world, where Cartoon Network’s entire programming slate is available on Hulu, and children now spend more time online than they do watching the tube. With an increasingly large role played in the industry by streaming shows released seasons at a time rather than by the old weekly model, creating an event that can generate discussion and hype is key to a series’ success. The only contemporary weekly shows capable of creating such an event are Game Of Thrones and, maybe, Walking Dead. Otherwise, it’s all about the fervor surrounding the release date of a full slate of House Of Cards or Orange Is the New Black or Making A Murderer. With StevenBombs, Cartoon Network is able to approximate the gravity of a binge-watching event with a cohesive storyline while staying true to its cable nature, driving up overall interest in Steven Universe and the channel itself in the process. The hiatuses that come as byproducts of this cycle are necessary evils that have always existed in Cartoon Network’s programming but feel exacerbated because Steven Universe is so damn good. If anything, the fact that they ache so badly means the show is an unmitigated success. So embrace the breaks—if kids can deal with them, so can adults—enjoy the Bombs and gear up for a “Summer Of Steven” starting in June. Regardless of how the show is scheduled (and perhaps with the backlash against hiatuses, Cartoon Network will stick with weekly programming despite the StevenBombs’ effectiveness), as long as Rebecca Sugar and company have made season three as compelling as season two, Steven Universe will continue to dominate.